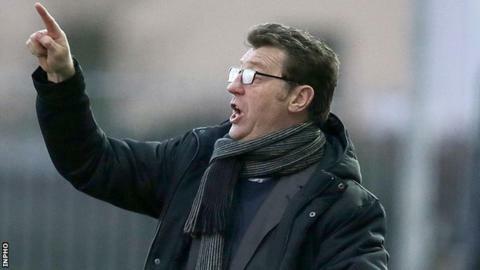 Derry City manager Roddy Collins has left the club following the team's disappointing start to the League of Ireland season. A brief statement from the club on Sunday night said the Dubliner had departed "by mutual consent". Collins only joined the club in mid-November following the exit of previous boss Declan Devine. Assistant manager Peter Hutton has been put in temporary charge of team affairs by club officials. After his arrival in November on a one-year contract, Collins opted to overhaul the Derry squad but the team have won only two of their opening 12 league games. Immediately after his appointment, Collins said that he had inherited "a very good group of young players" but he then opted to make radical changes to the Derry squad. Striker David McDaid and midfielders Ruaidhri Higgins and Kevin Deery were among several players released by Collins with former Sligo midfielder Danny Ventre, Cliff Byrne, David Elebert and his own son Roddy Collins Jnr among the new arrivals. Collins has been under pressure since the opening weeks of the season as Derry fans became increasingly unhappy at a perceived negative approach by the new boss. Amid the team's struggles, attendances have begun to dwindle and there were also question marks over his team selection after regulars Rory Patterson and Patrick McEleney were left out of the squad on occasions. News of the Dubliner's departure came after Derry had been handed an FAI Ford Cup away opener against First Division basement club Cobh Ramblers. Ramblers are without a win so far this season after seven defeats and two defeats in their opening nine games. Holders Sligo Rovers will face Dundalk at Oriel Park while the only other all-Premier Division tie is Limerick's tussle with Bohemians. Ties will be played on the weekend ending Sunday 8 June.